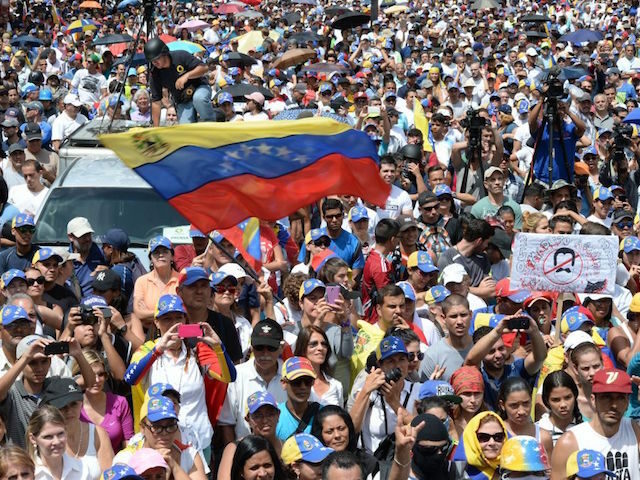 98 percent of the 7.2 million Venezuelans from around the world who voted in the non-binding referendum rejected dictator Nicolás Maduro’s plan to create a ‘constituent assembly,’ which critics fear will further cement the government’s authoritarian grip on power. Do you reject Maduro’s Constituent Assembly, a process seeking to establish a new Constitution scheduled to be held July 30? Do you demand Venezuela’s security forces support the opposition-controlled National Assembly legislature and the country’s 1999 Constitution? Do you support that Venezuela’s public institutions should be restored in accordance with the Constitution and whether the South American country should hold presidential elections before Maduro’s term ends in early 2019? Announcing the results, Cecilia Garcia Arocha, rector of the Central University of Venezuela, confirmed that 98 percent of participants had voted ‘yes’ on all three questions. She also pointed out that the number of polling stations, at 2,030, was much lower than in regular elections, possibly affecting turnout which was approximately 37 percent. Five percent of overall turnout came from Venezuelans voting abroad, many of whom have fled the country. Opposition leaders hailed the result as a victory for democracy and called on Maduro to scrap the plan altogether. “Today we awoke stronger. We carried out a democratic earthquake to break down walls and achieve a change,” Julio Borges, the leader of the National Assembly, said in a statement Monday. However, Maduro has downplayed the significance of the vote, describing it as “meaningless” due to its non-binding nature. “I urge the opposition: ‘Don’t go crazy, calm down.’ As president of the republic, I make a call for peace,” he said. There were also multiple reports of “irregularities” involving pro-government gangs known as colectivos across hundreds of polling stations. According to reports, three men on motorcycles opened fire on voters waiting in the queue, killing 60-year-old nurse Xiomara Soledad Scott, and injuring three others. Tensions are continuously escalating in Venezuela amid the country’s economic, political and humanitarian crisis. With inflation likely to hit 1500 percent by the end of the year, fewer and fewer Venezuelans can afford basic resources such as food, medicine, and sanitary products. A recent report found that over 15 percent of Venezuelans have resorted to scavenging for food, while a majority of people go to bed hungry. According to an ongoing analysis from Venezuelan outlet RunRunes, at least 108 people have died in daily anti-government protests since they began in April, as police increase their use of brutality to contain the protesters.